You will earn 4,921 Reward Points. Earn 1 reward point for every 1 dollar spent. Reversible cast iron broiler racks in 3” wide sections with 1/8” and 3/16” brand marks. Set of reversible cast iron broiler racks with 4 brand marks per 3” section. Brand 3/16” wide. 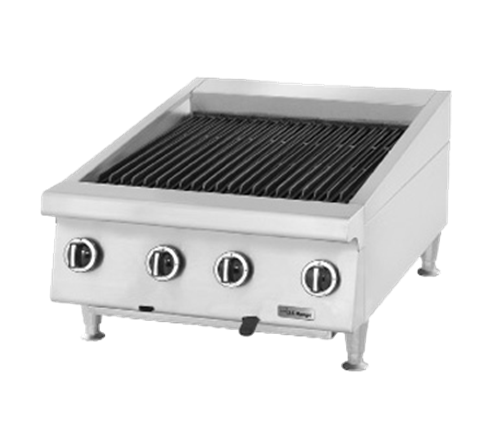 US Range gas radiant broilers are available with adjustable or non-adjustable cooking racks, in five nominal imperial widths from 24”(600mm) to 60”(1500mm) and with model UTBG72-NR72 only 72”(1800mm), 13” (330mm) high and 32” (814mm) deep. Reversible cast iron grates in 3” (76mm) wide sections overall cooking area depth 21 1/2” (546 mm). One 18,000 BTU burner with individual valve control per 6” of broiler width. Large stainless steel catch tray, stainless steel front, sides, and back.